“For every farmer under 35 in the U.S. today, there are six over 65. To keep farmers markets full of farmers, grow town economies, and continue our rich local food traditions, we must help more young people get started in farming careers.” So says the emergent National Young Farmer’s Coalition (NYFC). The group, which plans to make its national headquarters here in the Hudson Valley, was founded in part to address the challenges new farmers face getting started in this soil rich region –primarily access to land and credit. The NYFC is most immediately focused on winning critical provisions for beginning farmers in the next Farm Bill — microcredit, funding for training and support services. Peer to peer education, networking and innovation are further goals. 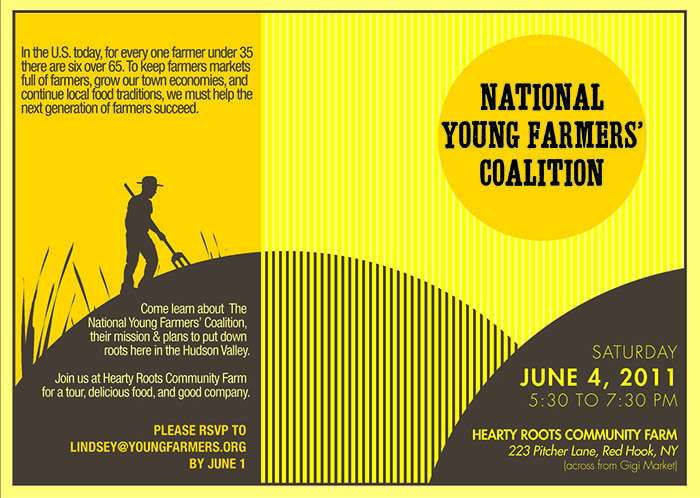 Learn more about the NYFC at their first local fundraiser Saturday, June 4th from 5:30 to 7:30 pm at Hearty Roots Community Farm in Red Hook. It’s most heartening that young people from a wide range of backgrounds are expressing interest in farming and food production. This is taking a range of forms in our region — from organic vegetables at Hearty Roots to grass fed livestock at Awesome Farm in Claverack and Tivoli to artisanal cheeses at the Amazing Real Live Food Co, whose mission is “producing restorative food and drink in our home…the Hudson Valley.” (You’ve got to love the optimistic spirit in these names — Hearty, Awesome, Amazing!) Another young woman has taken the family farm into a new market. Her Scoop shop features ice cream, smoothies, shakes and cakes using dairy products from her father-in-law’s Ronnybrook Farm. While these young farmers have already planted themselves in the region, a “growing” group of innovative initiatives are tapping into another population. They are linking local farms to local schools in an effort to educate students about agriculture, healthy eating and a myriad of farm, food and ag-related careers. The goal of the Columbia County Farm to School program — part of the Cornell University Farm to School Program is to “improve the health and well being of county schoolchildren by fostering awareness of and engagement with local agriculture and its products.” In addition to reaching kids, their families and the outside agricultural community, this program aims to impact school policies around food options, health and nutrition. It only makes sense for schools in the Hudson Valley, which are surrounded by outstanding family farms, to get more and more of their food locally. Public and economic policies need to help make that happen. Another pioneering new program in the region, S.E.E.D. (Smart Eating Every Day), is a collaboration between two national organizations, Healthy Directions and Mentoring USA, and the Red Hook Central School District. The project, creates a unique after-school program where students develop media messaging to educate their peers, families and communities about nutrition, wellness, and healthy living. S.E.E.D. has been successful in other locations around the country; the Red Hook project, which expects to launch in the 2011-2012 school year, is the first in a rural setting and has the potential to be a model for other local communities. Schools throughout the Hudson Valley are planting on-site organic gardens and using them not just to feed the school community. School gardens are being incorporated into classes from math and science to art, English, and, of course, health. New Paltz in Ulster County has two elementary schools with organic gardens which were so successful that kids requested one for the middle school; even in these financially stretched times, money for the new garden was raised pretty easily from local sources. Taconic Hills Middle School in Columbia County received a $4,900 Toolbox for Education grant earlier this year from Lowe’s for a greenhouse which will supplement the vegetable garden planted last year. The whole district will benefit from the new greenhouse, including high school students who will be offered electives in plant science, greenhouse management, agricultural issues, animal and environmental science. The Poughkeepsie Farm Project, which hosts class visits from Poughkeepsie area schools and has launched a school garden with urban Poughkeepsie High School, has joined up with the Hudson Valley Seed Library this year to make seeds available free of charge to school gardens and nonprofits with gardening programming. 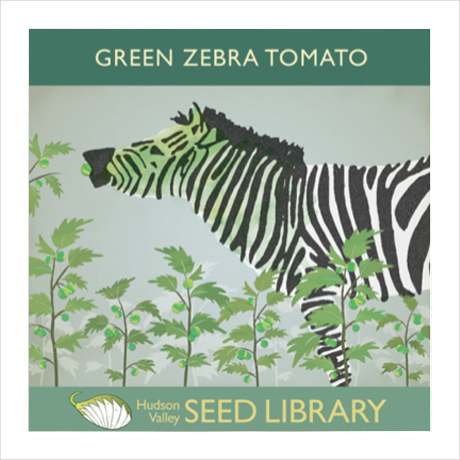 The innovative Seed Library folks also produce those charming seed packages with artist designed wrappers. Go ahead, hug a young farmer! This entry was posted in Didi's dish and tagged Amazing Real Live Food Co, Awesome Farm, Columbia County, Columbia County Farm to School, Dutchess County, Farms, Hearty Roots Community Farm, Hudson Valley, Hudson Valley Seed Library, National Young Farmers Coalition, Poughkeepsie Farm Project, Red Hook Schools, Ulster County. Bookmark the permalink.